The Initial Endemol production team uses TriCaster to produce the EuroMillions results on Tuesdays, the Lotto and Thunderball results on Wednesdays, and the EuroMillions and Thunderball results on Fridays. For the studio-based Lotto and Thunderball shows, five Panasonic HE60 remote head cameras are pre-set to capture wide shots and close-ups of the lottery machines, and the numbered balls as they are drawn. These locked off feeds are sent to the TriCaster. 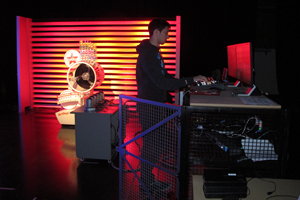 A PC-based graphics system linked to the ball machines and the TriCaster automatically produces a graphic for each ball and triggers the correct voice-over to announce which ball has been drawn. An operator vision mixes the camera feeds and graphics, and then creates a second pass to add additional sound bites before preparing the file for export and upload to YouTube. The results show is uploaded approximately an hour after the draw. The EuroMillions draws come from a satellite feed from Paris. The clean feed goes directly into Pinewood’s TriCaster at full frame and the system concurrently applies a crop to remove the Paris show’s graphics, saving time for the editor who can then easily apply local graphics and voice-overs before exporting.